Another outstanding hot-cold pair, very close to each other near Hoover Dam. Requires an 8 mile (round trip) strenuous hike down (an up) a rugged desert canyon (see YouTube video above). (Also, on our interactive map, switch to the "Google Terrain" view to get a good look at the trail route.) Wear hiking shoes, take plenty of water and tell someone where you are going. This from a hiker here: "WARNING: Wildlife is prevalent here! This means Nevada GREEN rattlesnakes, which can have deadly bite as well as big horn sheep that can also be dangerous. Stay away from wildlife here, they are more dangerous then they look, and a snake bite 4 miles down a strenuous trail with no help in sight could be life-threatening." See DIRECTIONS below for details. 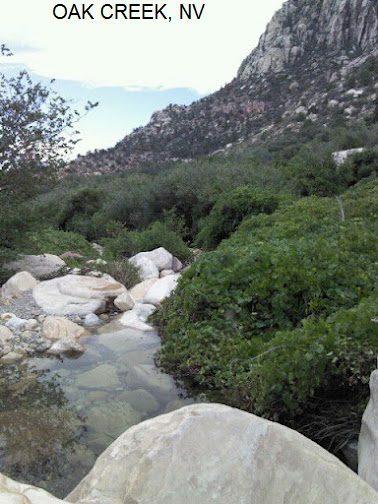 No developed camping on site, steep canyon trails. From Las Vegas, take RT 93/95 east through Henderson and Boulder City toward Hoover Dam and the Lake Mead Recreation Area. Go about 0.3 miles past the Hacienda Casino (which old-timers know as the Goldstrike Casino), exit right at the first off-ramp on the new highway (Exit #2 signed to Hoover Dam). 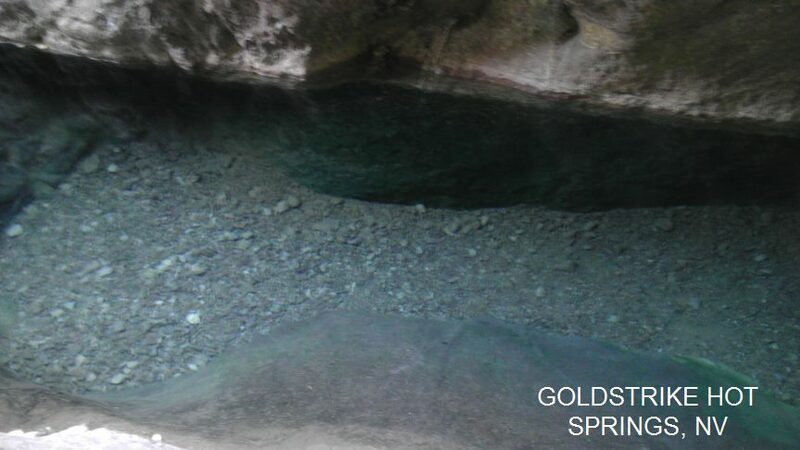 GOLDSTRIKE HOT SPRINGS [GLDH]: This from a visitor:" After a long hike, you'll find natural hot springs approximately 3.5 miles down the path (at approximately 35.98262,-114.74773). YOUTUBE - THE SPRINGS , PHOTO , PHOTO There are some climbing areas to get back into the springs, and this is a moderately strenuous hike, including ropes and ladders that are NOT park maintained, but maintained by regular folks, and are used often. The hot springs start small, and if you continue down the path increase in size. 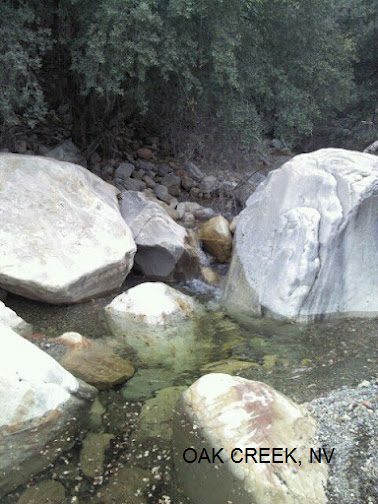 Even during the hottest point during the summer, water is flowing here from the natural hot springs. Three very large pools, one well over 6 feet deep have been built up and reinforced with sandbags, and there are two small waterfalls." "WARNINGS: This water is HOT. Do not stay in during summer for extended periods of time, test the water with your hand for temperature before submerging your body, there are several springs feeding here, and some are hotter than others. 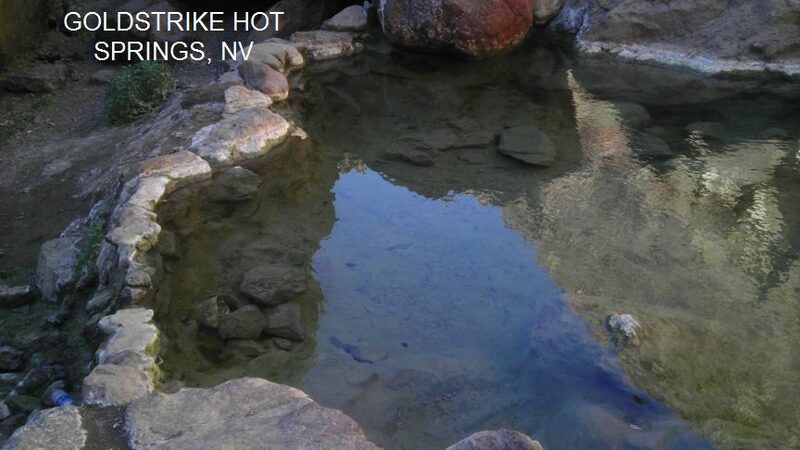 DO NOT submerge your head or face in hot springs in Nevada, ever! The water can contain a dangerous amoeba that can cause a serious brain infection." LAT, LON (of trailhead at end of road): lat=36.01054, lon=-114.77220 (source: Map) (accuracy:approximate). LINK TO GOOGLE MAP. Partially verified. Pretty confident. Updated 1/2012. COLORADO RIVER BEACH [COLB]: This from a visitor:" "The trail ends in the Colorado river, another 3/4 to a 1/2 mile past the hot springs. A rocky little beach makes a great place for swimming out here, there's even a bit of sand. The water is rather smooth here, a very slight downstream current. Some folks have actually paddled up here and done the trail backwards to go to the springs above. The water is very cold, I'd estimate it's between 55-60 F." This is pretty awesome, being just downstream from Hoover Dam - just hope they dont open the floodgates! LAT, LON (of trailhead at end of road): lat=36.01054, lon=-114.77220 (source: Map) (accuracy:approximate). LINK TO GOOGLE MAP. Partially verified. Pretty confident. Updated 1/2012. 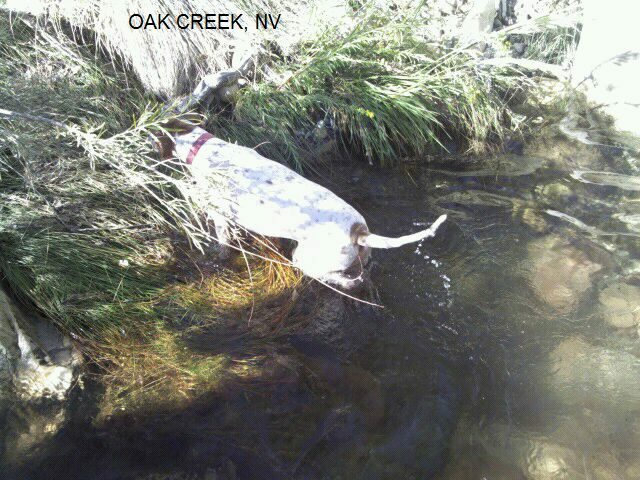 Quaint, fun swimming hole in the Nevada desert! Natural spring, but with a slide, diving boards and sandy beach. None - Humboldt N.F. and Great Basin N. P. are nearby. Camping nearby at either Humboldt N.F. or Great Basin N. P.
To get here from Ely, go north 12 miles on RT 93 to McGill. The swimming hole is at Dairy Road and Main Street. 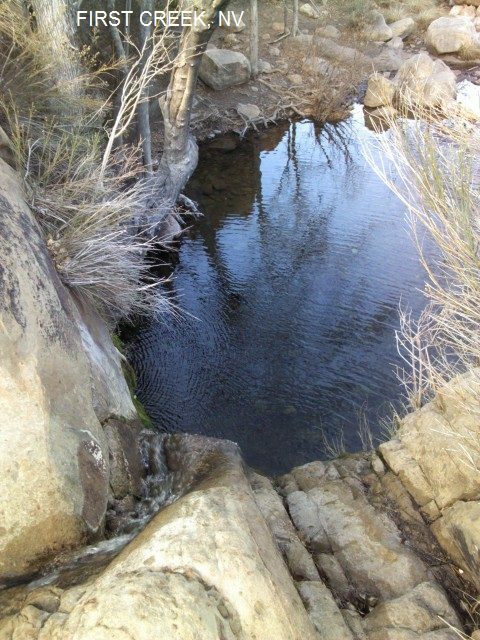 Easy hike to a spring-fed swimming hole in the beautiful Red Rock Canyon National Conservation Area (BLM). The canyon is a very dry, desert area but there are a few springs. BLM HIKING INFO. MAP OF HIKING TRAILS. For details, see DIRECTIONS below. Red Rock Canyon National Conservation Area (BLM). Entrance fee to Red Rock Canyon. There is a developed campground. Very exposed, shade ramadas over tables, no trees, no hookups, drinking water, vault toilets, not recommended for summer months, very hot. OAK CREEK [OAKC]:A ravine fed by a natural spring with two large pools for swimming, trail is about 2 miles (round trip) and easy to walk. PHOTO , PHOTO , PHOTO . This is HIKE #16 on the MAP OF HIKING TRAILS. To get here: Take the one-way Scenic Loop drive (13 miles). The turn off to the Oak Creek trail is the last available turn out in the one way loop - if you miss it, you'll have to loop around and drive another 13 miles. This last turn out is an often overlooked gravel road on the right-hand side; around mile 12 marker. Take the 1/2 mile road down to the parking area (has vault toilet). LAT, LON (of parking area): lat=36.11089, lon=-115.46607 (source: Map) (accuracy:approximate). LINK TO GOOGLE MAP. This from a visitor: "Take the rather easy trail (2 miles round trip)to the water. The trail will branch, but keep to the South, as if you were hiking into the canyon between the mountains, where the vegetation becomes more lush because of the water flow. The trail gets a bit spotty toward the end, head for the trail area with all of the tall trees and lush vegetation. Trail ends down into a ravine fed by a natural spring with two large pools for swimming, trail is about 2 miles, and easy to walk. The spring here is well covered, and I have seen very few other people there, could be ideal for skinny dipping (bathing suits optional), an absolute oasis! The water is absolutely clear, free almost completely of sediment, and has a gravel bottom. Sometimes the water here is several feet; after a rain or in the spring when snow is melting from the mountain tops. In the late summer, the water is still flowing and abundant, though the deepest pool I've experienced in summer was about 5ft, and the shallowest in that area was about 2ft. Because of the wading pools, could be ideal for families and pets." "The water continues down stream, but the vegetation is very over-grown down stream, especially in summer, making swimming difficult. Up stream during the spring (and possibly fall) there are other swimming pools, in summer they dwindle to wading pools of 2-4ft depending on heat index and rainfall, but checking upstream can prove fruitful, there are often nice places to swim or wade further up. I have not yet encountered wildlife of any kind here, other than pollywogs, though one might keep a look out for dangerous snakes and reptiles, big horn sheep, and wild horses and burros." Very confident. Verified by another. Updated 1/2013. 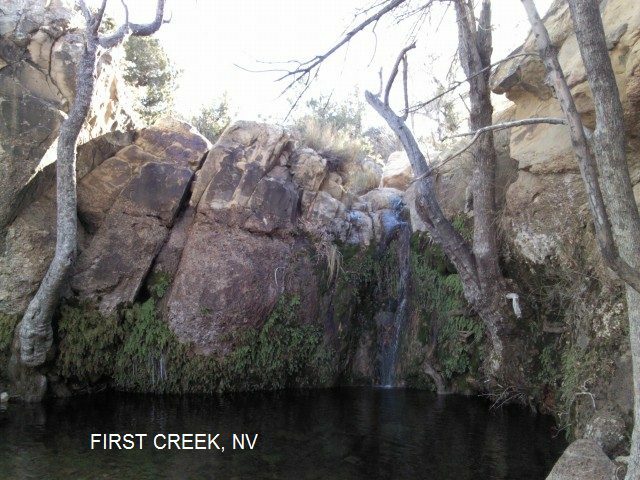 FIRST CREEK [FIRC]: About a 2 mile (round trip) hike to a seasonal oasis in the desert that is sometimes deep enough to swim (only in Spring, probably). This from a visitor: "There is a waterfall with a swimming area approximately 7-8 feet deep. PHOTO , PHOTO . The depth of this water will depend greatly on winter snow fall, rain, and time of year. The best time to try and find this area would be during the early spring. Keep an eye out for wild burrows as well, we've seen them here several times." "Warnings for this area: Do NOT attempt to come to this area during a rain storm. If it's raining, come back tomorrow. This area is well know for flash flooding and the water levels rise quickly to deadly levels, this goes for any body of water or wash in the Las Vegas Valley. Evidence of this can be seen all around the wash bed, water levels inside the wash clearly have exceeded 15ft, and this area is NOT inside Red Rock Canyon per se so it is rarely patrolled. Bring LOTS of water during this hike if it's at all warm outside, and especially in the summer be aware of snakes near bodies of water." To get here: Go as you would to Red Rock Canyon (above) but go PAST the Red Rock Park entrance and keep going past the exit as well. You will then pass several turn outs on the west (right) side of the road, keep going until you see the one signed "First Creek" (before Spring Mountain Ranch S. P.). This turn out will be on your right if you are driving from Las Vegas. Park here and walk across the wash onto the large main path (very well designated). After hiking for a mile or so the trail comes much closer to the canyon. Then head toward the first big pine tree that you see growing along the canyon rim. Next to this tree you�ll find a little unmarked trail (think this trail is at 36.08122,-115.46455 , not sure) leading into the canyon, toward a couple of big diamond-shaped composite rocks, and then downward to the waterfall. After a quick descent, you�ll find yourself deep in a rocky grotto that is covered with delicate green ferns and tall shady trees fed by a large pool at the base of a waterfall. This is a very serene spot, a complete departure from the dry desert environment just above and a nice preview of more good things to come a little farther up the trail. LAT, LON (of parking turn out): lat= 36.08136, lon=-115.44790 (source: Map) (accuracy:approximate). LINK TO GOOGLE MAP. Pretty confident. Verified by another. Updated 11/2013. In-town swimming (and tubing) places in the Truckee River. For details, see DIRECTIONS below. WINGFIELD PARK [WING]: Swimming holes in the Truckee River right in town. LAT, LON :lat=39.523947, lon=-119.817481 (source: Topozone-p) (accuracy:approximate). LINK TO GOOGLE MAP. Pretty confident. Not verified. Updated 12/16/2007. RIVER BEND [RIVE]: Not scenic, not deep - but a beach and a convenient swimming hole the Truckee River just west of Reno in Verdi. To get here from Reno: take I-80 west and get off at exit 5 and go about 1 mile toward Verdi. You will see on the right some bluffs and on the left a parking area and River Bend swimming hole. LAT, LON :lat=39.521228 , lon=-119.961444 (source: DeLorme) (accuracy:approximate). LINK TO GOOGLE MAP. Pretty confident. Not verified. Updated 12/16/2007.